A strict confinement is more like a Asian ritual. For Chinese in Singapore and Malaysia, we have to go through a 30-40 days long of confinement after birth, with various confinement restrictions as well as confinement diet comprising ‘heaty’ tonic food that helps to get rid of inner wind and water retention in the body. According to my mum and many Chinese old folks, consumption of quality confinement food and tonic soup is vital in achieving great post natal recovery. The main ingredients of confinement cooking are old ginger, sesame oil, red dates, rice/ glutinous rice wine, sweet vinegar, and etc. During the confinement period, we are not allowed to drink plain water, too. Sounds crazy? That’s what my mum believes, at least. She claimed that drinking plain water within a month after birth may introduce more wind into the body. Hence, only red dates drink, herbal soup, hot beverages, such as Milo and Horlick, are to be drank. You won’t believe it, even to take a bath, this special herb, Da Feng Ai, has to infused into your hot bathing water! No plain water allowed, even for a bath… (laughing). But well… I have to thank my mum who takes care of me and my diet during my confinement this month. My mum is not an expert in cooking confinement food, but she managed to come up with a wide variety of confinement food, both traditional and modern kinds. With her help, I need not to engage external confinement lady and still get a good confinement period, an even better one indeed (smile). Let’s start with the most important recipe first. Your important daily drink – the red dates tea. 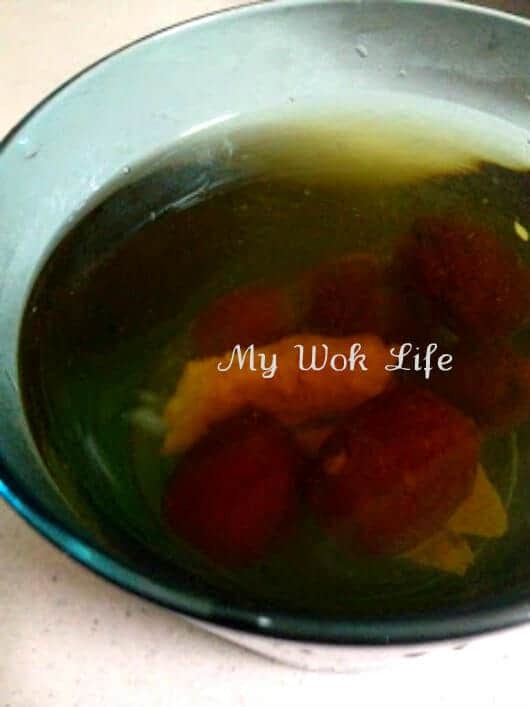 2 tablespoons of wolfberry (枸杞), optional. 1) Bring a large pot of water to a boil over high fire. Rinse the herbs once before adding into the boiling water. 2) Reduce fire to low heat and continue simmering for 20min. 3) Heat off and cover pot with lid to let it stand for another 10min. Then, transfer hot tea to a good thermal flask to keep it hot for a day consumption. Low caloric healthy tea. You may cook this even if you are not doing confinement (smile). * Cut the DangShen into shorter length for easy handling. * Eat the red dates, if you don’t mind. Congrats to you and your new born. 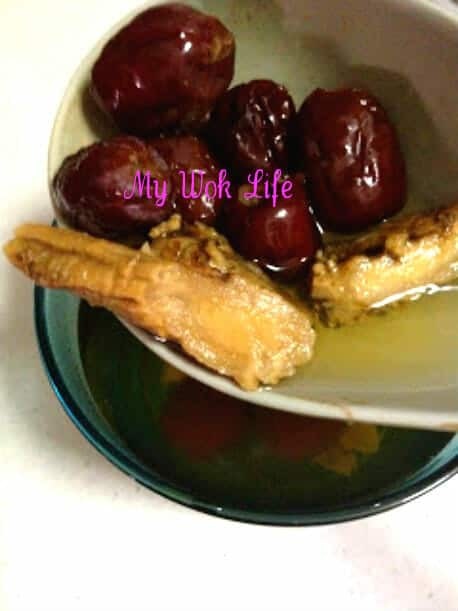 Surprise that you have the energy to blog, must have been the Red Dates Tea… Thanks for the interesting read. Hi and congrat to u too! Do u have also nutritious recipe for 1yo baby to share? Hmm… I have not reached ‘the toddler stage’ yet, and hence, am not cooking or having any toddler recipe on hand at this moment. In fact, I am still owing my confinement food recipes to the other readers… :( still finding time to write and post them….. Apologies. * Will post toddler recipe only in few months time.